Dr. Manu Vora is Chairman and President of Business Excellence, Inc., a global quality management consulting firm. He has over 41 years of leadership experience and has guided Fortune 500 companies with Baldrige Performance Excellence Award assessment. He is a Past Vice President from the American Society for Quality (ASQ) National Board of Directors. He also served as a Chairperson for ASQ Chicago Section. He is an ASQ Fellow and Certified Quality Engineer (CQE). Manu served as a Chief Judge at the Illinois Team Excellence Award Program from 1993-1999. He served as a Senior Examiner for the Asia Pacific Global Performance Excellence Award Program from 2004-2016. Manu holds an MBA with Marketing Management from the Keller Graduate School of Management in Chicago, M.S. & Ph.D. in Chemical Engineering from Illinois Institute of Technology (IIT) in Chicago, and B.S. in Chemical Engineering with Honors from the Indian Institute of Technology (BHU), Varanasi in India. For over 24 years, as an Adjunct Professor, he has taught Operations Management courses at various business schools globally. He is affiliated with over 80 educational institutions around the world. In 2016, he taught "Project Management for Organizational Excellence" a GIAN Course approved by the Ministry of Human Resource Development, Government of India at his alma Mater IIT (BHU). He was appointed as a Fulbright Specialist by the U. S. Department of State's Bureau of Educational and Cultural Affairs. He is listed in "Who’sWho in the World", "Who’sWho in America", "Who’sWho in the Midwest", "Who’sWho in Science and Engineering", and "Who’sWho in Finance and Business". Manu received "2016 Simon Collier Quality Award" from ASQ Los Angeles Section. He received "2015 Distinguished Alumnus Award" from BHU (his alma mater). He gave 2nd IIT (BHU) Institute Lecture on January 15, 2014. He received "2014 Harrington/Ishikawa Medal" from Asia Pacific Quality Organization, He has been honored by ASQ with 5 Medals. He received "1994 Joe Lisy Award" and "1993 Founder’s Award" from ASQ Chicago Section. He gave the 2003 Commencement Address at his alma mater at the Keller Graduate School of Management’s Milwaukee Center. He is a sought after speaker on business excellence and quality management topics for global audiences with over 600 presentations. He has published over 60 articles in professional journals. As an ASQ Influential Voice, he has written 50 blogs. In 2005, he authored "Managing Human Capital" chapter in the Six Sigma for Transactions and Service book published by McGraw-Hill. For over 45 years, he has dedicated his life to community service. In 1989, he established the Blind Foundation for India (BFI) to serve over 15 million visually impaired people in India. The BFI team has raised over $4 million to support over one million people in India for their eyesight checkups. 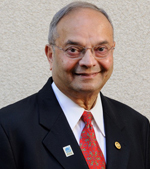 Since 1970, Dr. Vora has raised over $10 million for a variety of charitable and professional causes. He has shared his Leadership Excellence Series (LES) focusing on life-long transferable knowledge of soft skills and quality management free-of-cost to over 675,00 people globally. The LES project won the 2016 D. L. Shah Silver Quality Award from the Quality Council of India (QCI). In 2013, he gave two TEDx Talks (TEDxIITBHU, Varanasi, India and TEDxIIT Chicago). Manu received “2015 and 2000 Paul Harris Fellow Medals” from the Rotary Foundation of Rotary International “2013 Distinguished Alumnus Award” from IIT BHU Global Alumni Association, “2013 Alumni Achievement Award” from the Keller Graduate School of Management, “2012 IIT Alumni Medal” from the Illinois Institute of Technology, “2011 Ellis Island Medal of Honor” from the National Ethnic Coalition of Organizations (NECO) in New York, and “2010 U.S. President’s Volunteer Service Award” from the White House. He received “2008 Asian American Community Leadership Award” from the Office of the Clerk of the Circuit Court of Cook County, Chicago, and “1990 Distinguished Service Award” from Save The Children Federation. He received the prestigious J. N. Tata Endowment Scholarship in India for his graduate work in the United States.